It's officially June. Officially six more months until I test for my Second Degree Black Belt in TKD. Becoming a black belt was when I realized how much I didn't know. The past year and a half studying has been a completely different practice and hopefully it continues to be new and different everyday. I was going to write about where I stand now in terms of my understanding of martial arts as a discipline, art and philosophy, but I thought it more beneficial to revisit ground zero. Part of the testing material for First Degree was to write an essay about what earning a black belt means to me. This was probably one of the most personal and difficult things for me to write and share with the public. I started taking ballet at the YMCA in Indianapolis, Indiana when I was five years old. When I was seven I joined a proper dance company and from that moment until I was twenty-two, I was committed to dance. So in the meat of it all, between the ages of ten and seventeen, I was dancing twenty hours per week minimum. In middle and high school I added sports, theatre, and academic clubs to those loyal hours of dance. I was hard-working, focused and disciplined, loving and living for dance, but never was my long-term goal to become a professional dancer. I’ll admit; I was good. I was graceful, had great rhythm, remembered choreography easily, but I certainly did not have a ballerina’s body; no breathtaking extension, no natural flexibility, horrible feet. But I loved it. And I kept it up because it was ALWAYS a challenge. I fed off the fact that I had weaknesses and I wanted badly for them to become strengths, even though in the back of my mind, I knew that physically there were some things I just wasn’t made for and I would never do well. Sounds like a great path to becoming a disciplined person, yes. Dance taught me that. But I also adopted this little voice that moved into my head, through no one’s fault but my own, and told me I would never be good enough. Ouch. Cut to my twenties; I’m living in Los Angeles, working professional dance gigs here and there and exploring new forms of art; specifically acting. By the way, I’m a Gemini, so I can never sit still and I’m interested in a million things at one time. I’m becoming a jack-of-all-trades, master of none. And guess who still lives in my head? The voice that now consistently, without fail, tells me I’ll never be good enough. At this point she deserves a name. Let’s call her Samantha. I graduate from an acting conservatory, start working professionally as an actor, because now that’s what my heart is telling me to do, and start to dabble in writing, producing and directing. At this point I’ve been focused on acting for about 10 years and through that exploration, learning so much about life, about myself, about the world and loving this new challenge. But Samantha still lives with me, she’s not even paying rent and I’ve developed this extreme lack of confidence that is becoming harder and harder to live with. I feel trapped in a circle of mediocrity and it seems incredibly daunting to get out. Cut to my 29th birthday and Samantha is nagging me like never before. I feel so unaccomplished despite all that I’ve accomplished. And do you know where she excels the most? In my physical endeavors. She’s really good at making me beat myself up there. I certainly am, as they say, my own worst critic. Never good enough. I’m thinking, “I’m almost 30 and I can’t say I’m accomplished at anything!” All of my interests were so subjective in nature. I needed an endeavor that had some sort of objective, concrete system of noted achievement. Cut to Day One. I put on my crisp, white SRTKD uniform complete with stiff white belt and started training three times per week and I loved it so much, it became five times per week. I hadn’t trained my body that hard and that focused since my senior year in high school! It was exciting to become obsessed again. I felt like I could reinvent my physicality in this new world of movement and art. And wouldn’t you know it, Samantha thought she could reinvent herself too. Yep, in the beginning she showed up to every class with me. And she had new things to say! Things like, “You don’t deserve to be progressing this quickly,” or “You can only do that because you did something like that in a modern dance class once.” And because of her I would refuse compliments, which in turn never let me closer to the person giving the compliment and kept me from truly appreciating that person’s art. But this is not a place for individuals. It’s a place for community where people care about each other and are inspired by each other and are healthfully competitive with one another. As soon as I start learning new standing and kicking positions I realized it wasn’t going to work to move like a dancer in here. It wouldn’t be right. I couldn’t do what I knew was safe and what I knew I was good at, because this was a system of movement that was so completely different from what I’d been used to my entire life! I had to fail. So I did. I felt silly when I did. And then a new voice came along that unknowingly told Samantha to shut up and that was the voice of Master Simon Rhee. And his voice was encouraging. “Oooo I like this new voice.” After a while his encouraging voice-that was also demanding (so it spoke my language)- quieted Samantha. I could still hear her, but she wasn’t so affective anymore. Once she was quiet and Master Rhee’s voice was more dominate I was able to take my attention off of myself (thank God). I put it on my classmates and learned from them. Every single black belt shows so much genuine care in your progression along with humility, that it’s not scary to ask for help and it’s easy to take a critique-in fact, I’m ever so grateful for that critique. I think this is evident to every colored belt. We all feel it. That feeling of being accepted and safe fosters risk-taking which I feel like I’ve learned to love. So at this point, about a year and a half into my training, after many moments of failure and learning, I experienced some moments of realization and revelation. And these exhilarating moments came to me by way of another new voice that I had heard occasionally in the past, but always very softly. It was my voice. My voice said things like, “Who cares what you look like?” and “Hey, that was pretty good,” and “Phew, that was rough. I need to get better at that.” Eventually, this self-acceptance and appreciation became a default response. The fear of not being good enough was a distant memory, which made me even more willing to take risks, which allowed for more instances of success. All in all, I was feeling more honest with myself and for me that was the key to improvement. But it was no coincidence that this happened at this studio. Master Rhee has a subtle, underhanded way of teaching you how to teach yourself. He doesn’t correct you on everything all at one time. He gives you a little nugget, the most important correction and trusts you will figure out the next correction in time. He also has no ego. It’s not all about making his students look good just so he will look good. It’s not about having a full studio and doting followers all over the world. It seems that to him, Tae Kwando is a way of life for each individual and the nuances of that lifestyle can and will vary from person to person. That’s such a beautiful thought. It’s about discipline, respect, strength, integrity, honor, friendship and the biggest hurdle for me at this stage of my life, authenticity. This is where the art lies. I had a moment a few months ago after class when I was feeling very emotional. I felt like I had done what Master Rhee and I had asked of myself physically, but I wasn’t satisfied. I had felt like this a few times recently and though I know he’s not a therapist, I thought I would take a chance and cross what I thought was a bit of a personal line. I decided to open up to him in hopes he knew what this feeling was and could help me through it. With tears in my eyes, I told him I felt that I wanted to express something in my movement, but I couldn’t figure out what or how. I felt like I was just trying to get it right technically and that was not satisfying. Now the tears were on my dobok. I’ll never forget his response. He looked completely baffled, but then spoke straight from his heart and said, “It doesn’t have to be anything. Don’t worry. Just keep doing it.” It was the most annoyingly simple, yet profound advice. That was the day I realized where the art lied in this martial art. It was like a big, empty hole in my practice that had a sign over it that read, “Insert your art here.” I hadn’t accomplished it for myself, but I could see the potential. Over the past two years as I would test and belt I’d realize what elements of my training have progressed and where I had troubles. The testing made sure you knew the material. The next belt material would be contingent upon whether you had the previous material down pat. You needed that foundation. 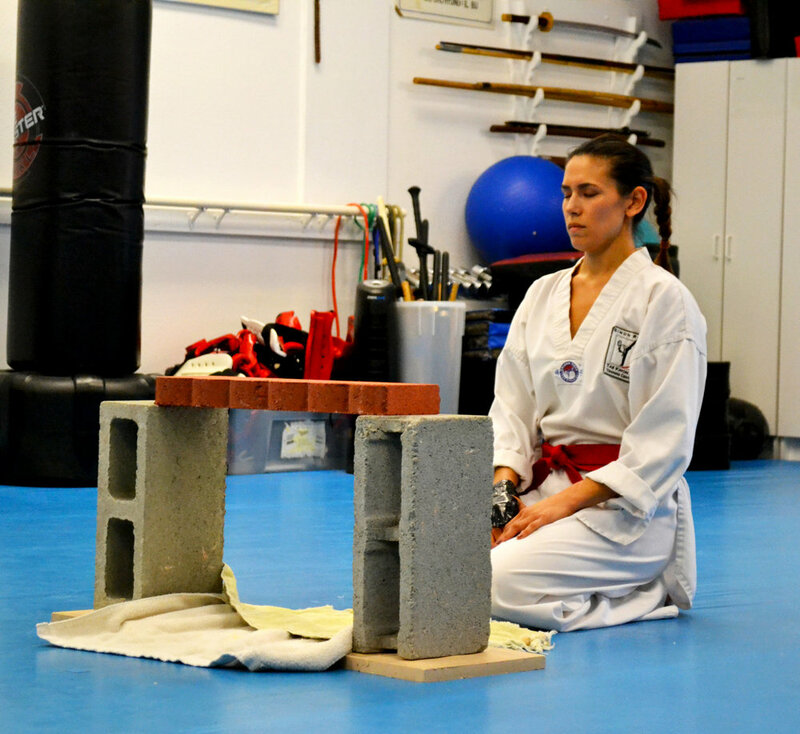 I would learn some lesson in class such as, ‘I always hold back and kick AT the pads instead of THROUGH’ and I could take that lesson and apply it to material from say, three belts ago and it suddenly made more sense and flowed in my body better. Just one month ago, that is only one month away from black belt testing day, I had a bit of a Dorothy moment where I realized it wasn’t the actual belt color that proved to myself my accomplishments. It was the lessons I’ve learned and the person I’ve become that help me to acknowledge my accomplishments. I had that ability in me all along. Training in Tae Kwando at SRTKD has given me true confidence in my abilities, made me more independent in how I learn and has taught me authentic humility. It’s always been hard for me to accept a compliment. I don’t think I’m alone in saying that. But now here at this studio if someone gives me a compliment, I thank them genuinely for expressing a kind comment to me about me. I believe that compliment is also to Master Rhee and all the students and teachers here at SRTKD. Because this is truly a collaborative place, where people care about each other and the art. I believe that all art is one art and I’m learning how to accept and use every part of myself that I’ve discovered through Tae Kwando to help me fully round out my art. I’m very kinesthetic and connected to my body and TKD helps me to go further in my expression through those channels. Art always changes and evolves as we ourselves change and evolve. In TKD I understand that you are constantly evolving your practice and your process. Words like Samantha’s, “You are not good enough,” don’t mean anything. Good enough to do what? To be training here? Because I am training here. To love the art? Because I do love it. To call yourself a martial artist? Because I will be able to one day. I plan to continue Tae Kwando. In this at form like all others, there's no arrival. And not only am I okay with that, I'm excited. It's not daunting. It's freeing. Older PostMuseum of Ice Cream!